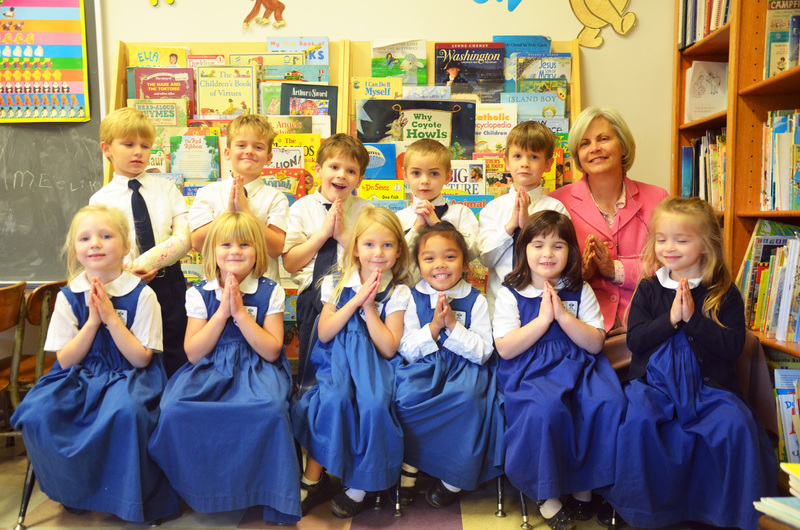 Kindergartners pose for a picture with Mrs. Gallaher. Religion: Catholic Children’s Treasure Box, My Jesus and I, Leading Little Ones to Mary. Phonics: ABeka Letters & Sounds K5. Reading/Literature: BOB Books; Duck CK Book; Faith & Freedom Readers; Catholic National Readers; America Cardinal Readers. Mathematics: ABeka Number Skills K5. 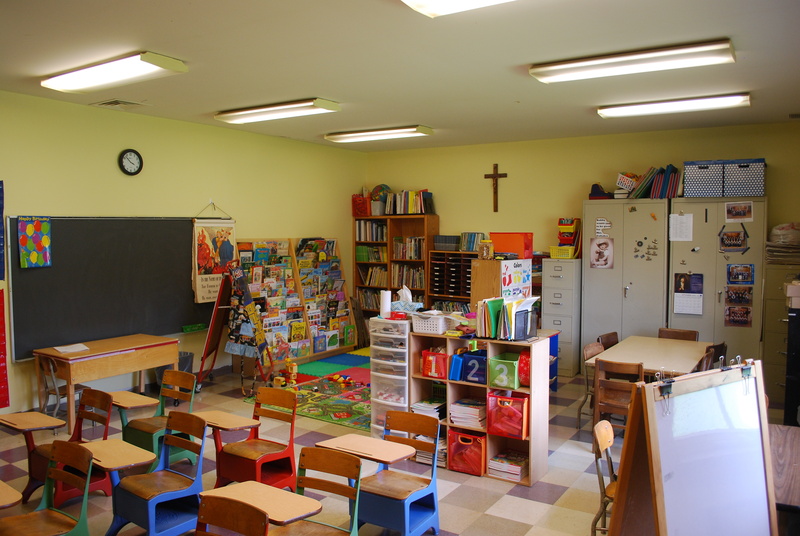 Classrooms in Kindergarten and 1st grade are set up with books and activities for students. Science: Our Father’s World, God’s Creation Series; Earth Science, Planets, Weather. Students blow up balloons for a class party! 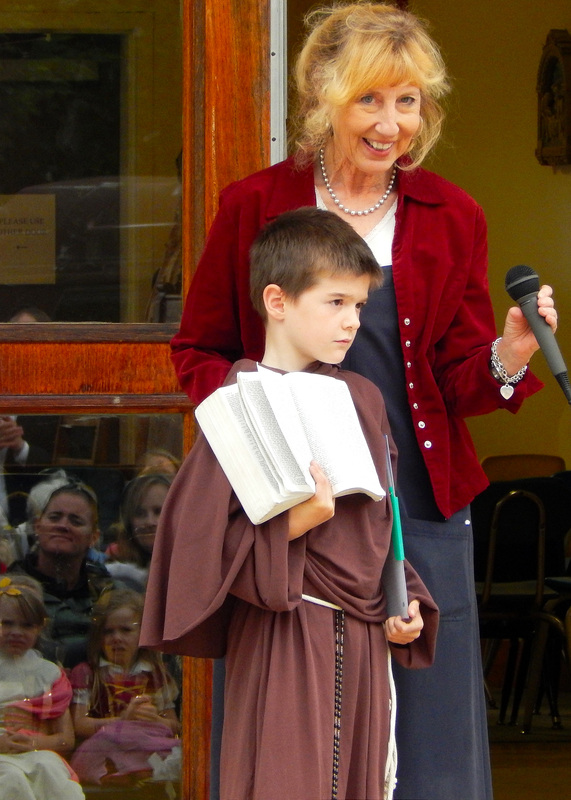 Mrs. Whitter with a third grader at the All Saints pageant. Grammar: Building Christian English #3. Reading: Cardinal Readers; The Little Flower; Door in the Wall; Christmas Carol; Swiss Family Robinson. History/Geography: Our Country; How America Began. History/Geography: How America Grew; Virginia History & Geography; US States and Capitals; Famous Men of Ancient Rome. Religion: Baltimore Catechism Number 2; Faith & Life Series 5; Holy Bible, Books of Daniel, Psalms, and Acts. Spelling: Spelling for Young Catholics. German:Langenscheidt German-English Dictionary; German: How to Speak and Write It by Rosenberg.